A Tall Story won 4 stars at BIAFF 2008. Clive's film Picasso of the Pier won a Gold award and a Sponsor's prize at BIAFF 2007. Some years ago I was staying in Derbyshire with a friend. We were exploring a churchyard in the village of Hathersage and to my surprise we came upon a grave with a headstone purporting to be that of Little John, the trusty lieutenant of Robin Hood. At the time, this struck me as extremely odd. I thought Robin Hood and his merry men was the stuff of myth and legend. In the summer of 2007 I went back to Hathersage, armed with a script and permission to video in the church and churchyard. The script was mostly compiled from internet research and it took me some time to discover the full story. Was this Little John's grave? If not, was it someone else's? Was it a grave at all? Why was there a Little John public house in Hathersage? There were references to Little John's cottage near to the church gate. Was this true or false? Why did the village fete always feature a man dressed as Little John? The day of the first shoot was sunny and I covered all the graveyard shots and the church interiors in about 2 hours. The church secretary was extremely helpful and was very interested in my project. My next shoot was in the countryside looking down on the village of Hathersage and I also spent some time in the village videoing the exterior of the Little John Tavern. The most difficult location of all was a local village fete. For my first shot, I stood on a table outside a pub and for the second, I balanced precariously on a wall with my camera strapped to a lamp post. My final location was in the grounds of Middleton Hall on the outskirts of Birmingham, where I found my ideal Little John's cottage. The editing on Casablanca went smoothly enough, probably because I always shoot at least three takes of every shot. 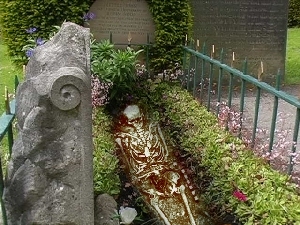 Three of the shots were doctored in Photoshop, the most difficult of which was superimposing a skeleton on Little John's grave. All my friends pull my leg because of my meticulous planning. I surprised them all by changing the final line of the script at the last moment. Did Little John exist? Is he buried in Hathersage churchyard? If you want to find out, you will have to see the film.